Last night I was convinced that today would be a snow day. I am fully aware that this belief was not founded on anything logical. It didn’t snow yesterday, it wasn’t supposed to snow much last night, and I teach at a university, so you don’t really get snow days to begin with. But snow day hope is a hard thing to kill. So instead of packing my lunch, laying out my clothes, and going to bed at a decent hour… I stayed up watching TV till 2 am. 2 AM. I blame it on James being out of town and taking all sense of reason with him. To top it all off, I made the mistake of staying up to finish a season of Revenge, which meant I was then wayyyyyy too scared/angry/emotionally keyed up to fall asleep. And then that alarm went off this morning. No snow day. Reality hit like a day you thought there would be a snow day and then there wasn’t. 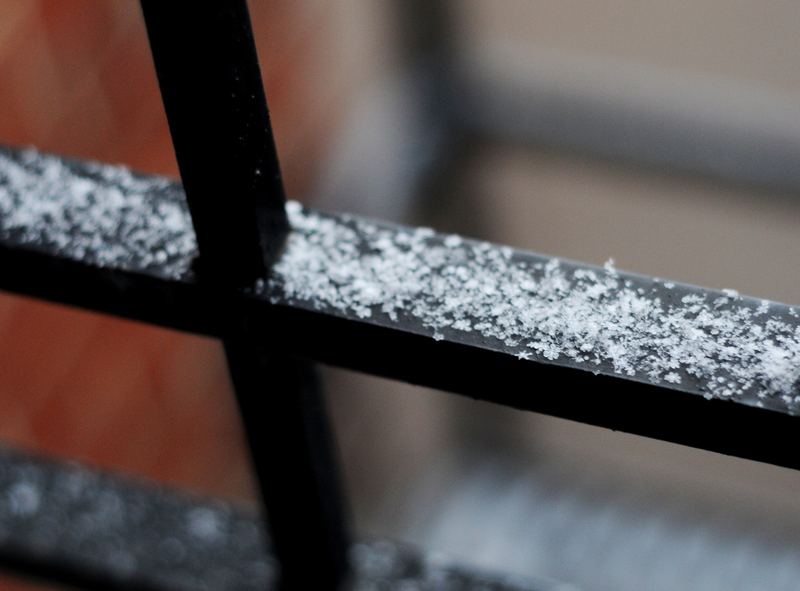 But then again… there was still some snow this morning, and who can be truly upset when they look outside and see it frosted in white? 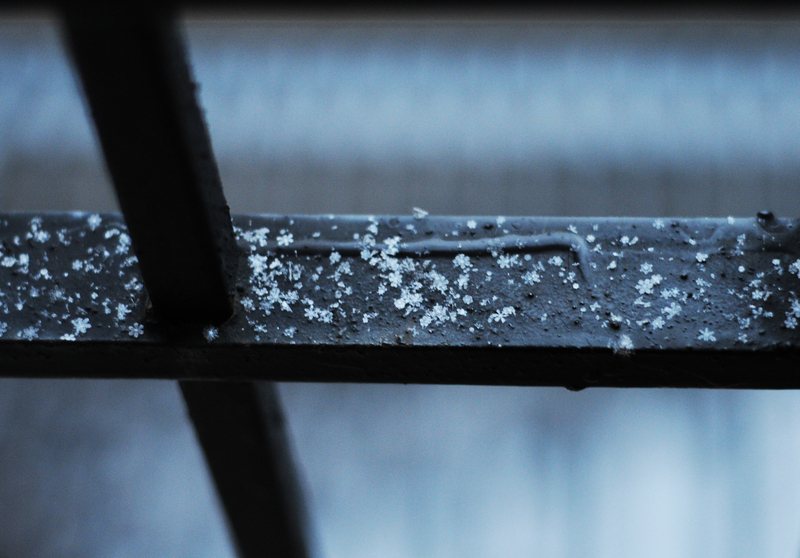 If it’s been awhile, go find a single snowflake and look at it. 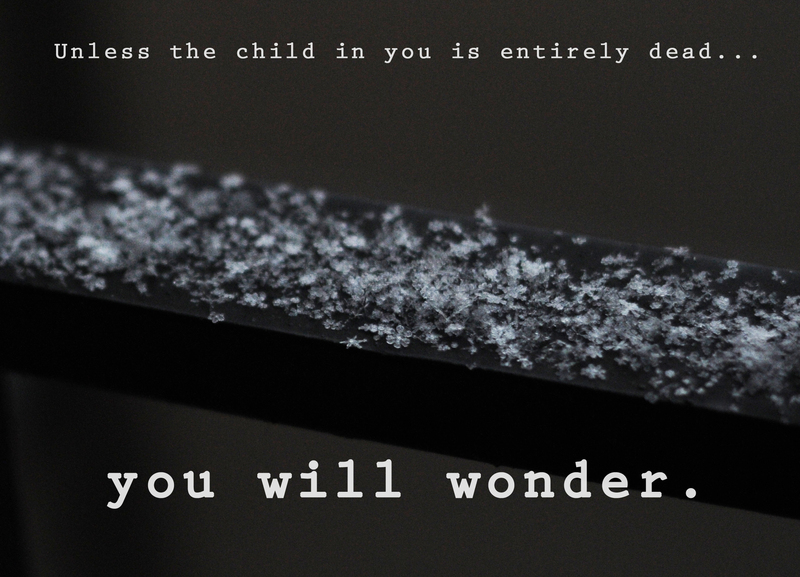 Unless the child in you is entirely dead, you will wonder. Wonder is the very best response when faced with individual snowflakes. This entry was posted in Uncategorized and tagged daily life, photography, quotations, seasons, snow, winter, words. Bookmark the permalink. Have you read that entire Buechner book? It’s in my all-time top five. Also, I’ve been pouting all week because it snowed twice this week and last year taught me that every time it snows you get a snow day. It’s been tough to bounce back. I haven’t but now I really want to!!! You did get spoiled last year… why can’t we just have snow days for the days it gets so cold that we shouldn’t have to go out?? You would think that the MI years would have made us strong, but I feel it just made me appreciate how cozy it is to be inside during snow. Tommorow I do not want a snow day–even though the weatherman says snow is coming– because I’m planning on going to Cincinnati. However I still feel a little zip of excitment whenever I open the curtains and am greated by a white blanket. love the photographs on this one!